Ken Wyatt receiving the influenza vaccination at Tuohy House in Midland. AGED care providers will be required to offer flu vaccinations to all staff under new regulations introduced to maximise protection against influenza outbreaks. 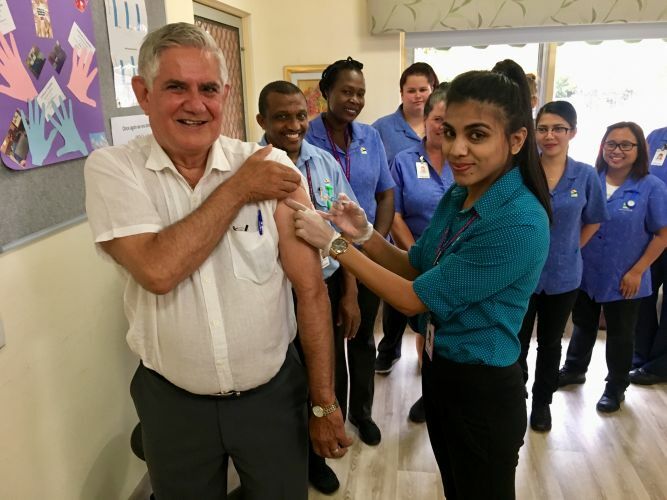 Federal Aged Care Minister and Member for Hasluck Ken Wyatt announced the new regulations yesterday at Midland’s Tuohy House, which already makes free influenza vaccinations available to its staff. “It will now be mandatory for every aged care provider to offer the flu vaccine to every single worker,” Mr Wyatt said. “Already, the Federal Government has made two new ground-breaking flu vaccines available to all people aged 65 years and over, free of charge. Mr Wyatt also released results of a national survey, which included aged care homes in Hasluck, showing a significant link between increased staff immunisation and lower aged care influenza outbreaks. “Last winter, aged care homes with only a quarter of their staff vaccinated had a 25 per cent higher rate of flu outbreaks than those with three quarters or more of their staff vaccinated,” he said. In 2017, just over 1100 influenza-associated deaths were reported in Australia, with people aged 65 years and older accounting for more than 90 per cent of these. “Vaccination is imperative for staff and residents in aged care, where the flu can spread quickly and have devastating consequences,” Mr Wyatt said.